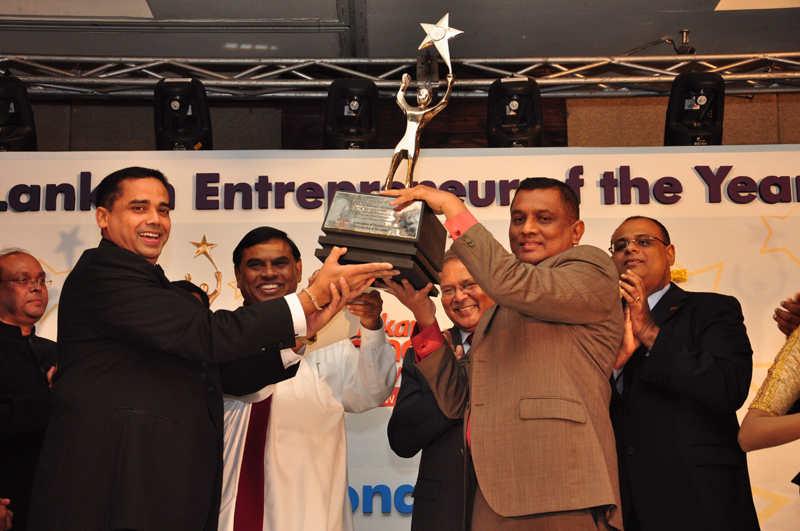 Mr. Lal Keerthi Gunawardena, Chairman and Managing Director of the Lucky Lanka Milk Processing Company, Kamburupitiya was crowned as the Sri Lankan Entrepreneur of the Year 2011 at the National Award ceremony held at Cinnamon Grand Colombo on November 23, 2011 organized by Federation of Chambers of Commerce and Industry of Sri Lanka (FCCISL). FCCISL also confer “Hall of Fame” award on Mr. M.P. Wickranasinghe, Chairman of Ceylon Biscuits Group (CBL) for his outstanding contribution made to the national economy by creating CBL Empire. National Gold Award was awarded to Mr. Sujeewa Pilliaguruge, Managing Director of Oak-Ray Group in Kandy. There were 27 national awards been awarded to entrepreneurs from small to extra large categories representing various line of business from different parts of the country. This is the sixteenth edition of the annual event which commenced in 1995. The selection of Sri Lankan Entrepreneur of the Year denotes not only the flagship of the FCCISL work programme but also the most prestigious and coveted business awards of the calendar of the chamber movement in Sri Lanka. The unique feature of this award scheme is that the recipients of awards are being selected on both at provincial and national level which is particularly attracted to small and medium scale entrepreneurs who have to undergo numerous difficulties in achieving excellence in business. Thus this programme is a tribute paid to the local entrepreneurs by the nation. Entrepreneurs are the cornerstones of a vibrant and booming economy. Their unique blend of skills constitute a non quantifiable national and needs to be recognized, rewarded and nurtured for socio economic advancement and sustainable development. Dialog Axiata PLC, HNB Assurance, Bank of Ceylon and NOLIMIT were exclusive guarantors of this prestigious event, while Wijeya Newspapers, Thinakural, Sri Lanka Rupavahini Corperation, Neth FM, Bates Strategic Alliance, AV Productions, Cinnamon Grand Colombo and Flexport were partnered.